First responders put their own safety on the line each day to rescue and protect the communities they serve. But one brave firefighter, dispatched to a house fire in California this week, went above and beyond to ensure that everyone — including a family's furriest members — made it out alive. On Tuesday, the San Diego Fire-Rescue Department responded to a blaze at a residence. 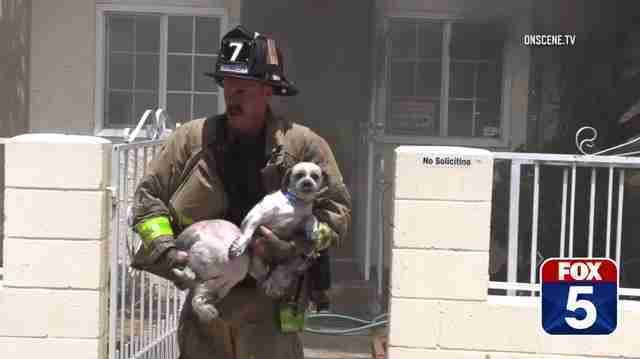 Though its human occupants managed to escape from the burning home on their own, two small dogs remained trapped inside. Upon learning that fact, one heroic firefighter rushed inside to save them. Time was evidently of the essence, as indicated by the fact that he entered the building without equipment to protect him from the smoke indoors. 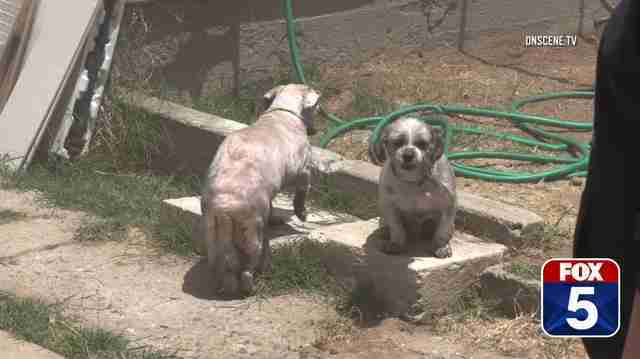 The dramatic moment was caught on video by news station FOX 5 San Diego. Fortunately, the dogs appeared to be in good health following their scary close call — all thanks to the firefighter who decided that saving them was part of his duty, too. You can help save the lives of pets in similar situations by making a donation to Project Paws Alive — a nonprofit whose mission is to provide all first responder agencies with pet-sized oxygen masks, so that medical care can be properly provided to animals when it's needed most.